It seems fitting that they left too soon, the baby spiders. 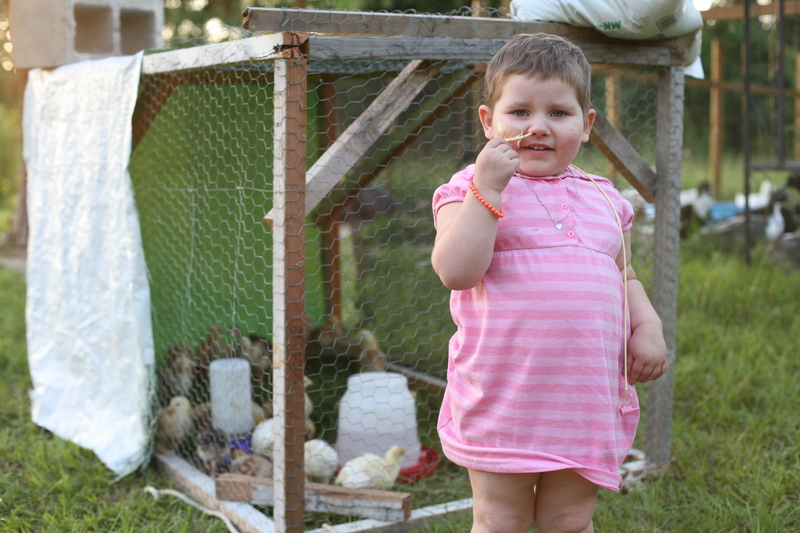 Phoebe, the boys and I watched their mother spin her beautiful gossamer egg sacks in the spring. I have watched them through my laundry room window through the fall and then on past Phoebe’s passing and into the winter. Each time I start a load of clothes or grab the broom from the laundry room, I look up to see if they are safe and intact, and they are. Until this week. A warm blanket of sunshine broke through the chill of the former weeks and graced us with a 70 degree day. The spiders had their cue to hatch, break free of their cocoon and float away on the wind to find new homes and grow. So they left. Too soon. 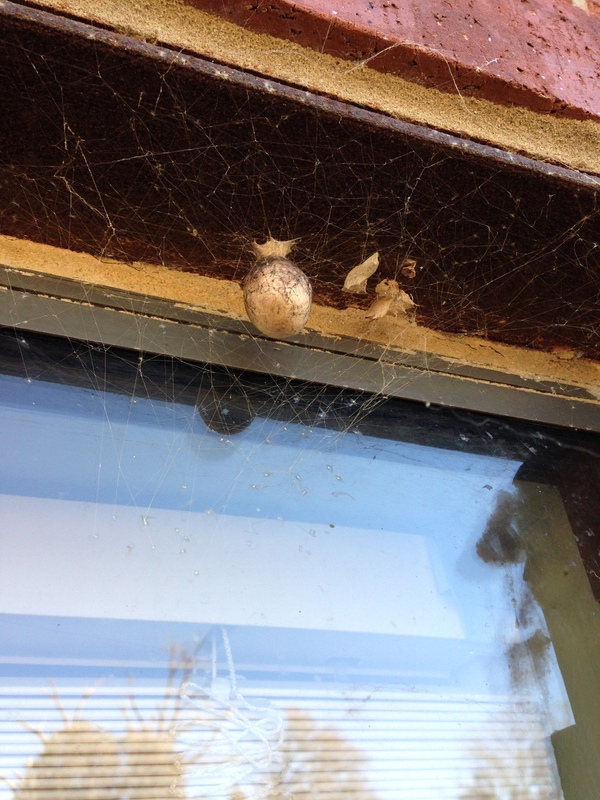 My heart was a little broken when I looked through the glass and saw the tattered egg sacks flapping in the wind. I half expected that somehow, some way, I would be there at just the right moment to watch them climb on tiny legs out into the sunlight and float away. Maybe I would go to turn the garden hose on at just the right time or peek out the window just as they began to emerge. It would be triumphant, a moment coming full circle. I would witness the fullness of the miracle that Phoebe and I had marveled at as it commenced. The boys and I would take pictures, I would post them on the blog and share the beauty of the moment. I sighed to myself as I peered out the window and folded a towel, disappointed that I could no longer look forward to their emerging. A little piece of hope up in the corner. One remaining egg sack waiting to hatch in the spring. 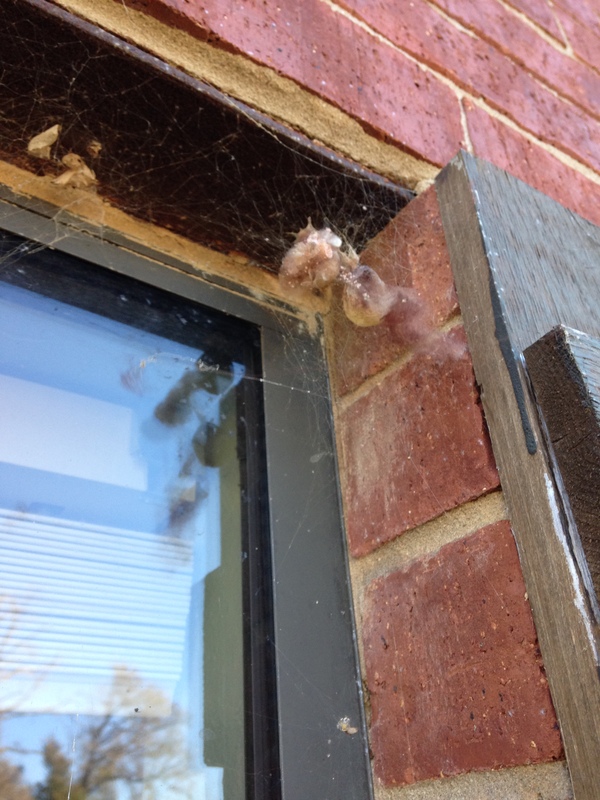 And the spiders that left too soon made me think about Phoebe and how even departures are ordained. Who can thwart His good purpose in everything? I cannot see the over-arching good yet. In desperation I would trade it all to have her back. But I see through a glass dimly. And this I know very well. His infinite-ness and His intimate acquaintance with me; for even the hairs of my head are all numbered, make me know that He will heal and bind and that this all makes sense somehow and somewhere. He is good. Yes, He has been good to me. Sometimes that statement is a sacrifice of praise, and other times it is my heart song. I hope the little spiders stay put until Spring and that I have the opportunity to watch their crowning, but if it isn’t to be, it was all a miracle anyway. It’s been a good couple of days following a rough couple of weeks. Remember, as a child when that one older boy would give the merry-go-round his strongest running push? You would hang on for dear life as the centrifugal force would try to rip your little hands from the bars and you couldn’t wait to get off. Sometimes I get to exit the ride for a day or two, but my stomach still churns from the after-effect. Nathan and I have been attending a grief support group called Grief Share the past two weeks and it’s been a comfort. The first night we went to group we introduced ourselves and all shared who we have lost. After this they turned on the video. And there he was, my Grandfather, sitting in his living room. The living room I got married in, the living room of my every Christmas Eve and family memories. And he was there, talking without Alzheimer’s, his memory fully intact, looking into my eyes and telling me to embrace the grief and allow it to show, for by this I am demonstrating the depth of the love I have for the one I lost. I wasn’t expecting him that night. Hot tears sprang to my eyes and rolled down my cheek in the dark room. Nathan searched for my eyes from across the room and shook his head in amazement. I had forgotten; years ago my grandfather was a contributor to the Grief Share ministry. He lost his eldest daughter, my Aunt Suzie, when I was a senior in high school and subsequently wrote a book called ‘Confessions of a Grieving Christian’. His personal walk through grief moved him to be a part of this project, and here I was, years down the road benefiting from it. By the time Phoebe was diagnosed my grandfather was declining rapidly from Alzheimer’s. Sometimes he would recognize me, other times not. He loved my children and held them on his lap and teased them without fully realizing they were his great grandchildren. The last time he saw Phoebe in the hospital, she was septic and intubated and I could tell he felt uncomfortable and like he was intruding on a private situation. He didn’t realize that it was his great granddaughter in that bed. Always the encourager, and one to share wisdom and direction; I know my grandfather would have had something to say to me that would give me hope in the midst of my journey had he not lost his memory. This was a familiar journey for him and he would have imparted strength, empathy, compassion and love. That night, in the grief group in darkened room he was doing just that. He was speaking into the future without ever realizing that I would need those words so desperately. I’m thankful for his obedience to do what I know what painful for him. He passed away last year shortly after Thanksgiving, and one of the thoughts that comforts me daily, is knowing that my Phoebe is with my Grandy. I know what it is to be loved by him, and I know what it is to be loved by her. It’s hard for me to imagine two people more loving than these, so I can’t begin to fathom the love they are sharing with each other now. It makes me smile. There are more sweet moments with God’s fingerprints all over them that I want to share, and will when I get a chance. I am finding Him faithful and steady even when I am not. It is often hard to hear His voice over the raging storm that is grief, but I keep my ears open. Deacon went to collect the eggs from the chickens this morning. Minutes later, muffled pleas for help made their way to my ears. I threw on my galoshes and ran outside to find our dog Sadie with her teeth around a rooster’s neck and Deacon flapping his arms like a chicken screaming at her. Our other dog Howdy was running around barking and the scene was chaotic. The door to the chicken coop was still open and as I wrangled the rooster free of Sadie’s jaws another one escaped. I wrestled both dogs to the ground, pinning them under my knees while Deacon tried to corral his crowing subjects back into the coop to no avail. All this while still wearing my pink pajamas and polka-dot rain boots mind you. In our front pasture, mid-morning. I just knew the neighbors would come outside to see what all the ruckus was about and there I’d be. My cheeks reddened at the thought. It soon became obvious that the rooster was outwitting Deacon and I needed to step in. So I drug the two reluctant canines to the house, yelling and jerking them towards the front door as they tried to back out of their collars. This was not the peaceful Saturday morning I was anticipating. 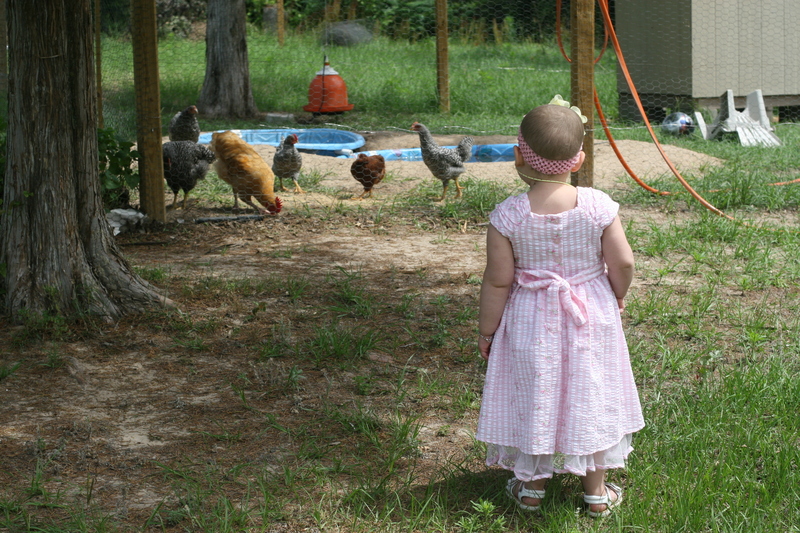 When I got back to Deacon we worked together and finally corralled the birds back into the coop. I locked the gate and we made our way back to the house so I could finish my coffee. Fast forward a couple of hours and Deacon and I are on our way out the door to go to the garden supply store. I slide into the driver’s seat when I notice that ALL of the chickens and roosters are having a meeting by the neighbors fence-line. They are not in the coop. They are staging a coup. Madness ensues, all the big boys are away for a morning with Dad, and Deacon and I are responsible for getting all of these birds to go back. At least this time I have clothes on. After several unlucky attempts at trying to bait them with food and herd them toward safety, we give up. All of the birds are now tucked into the brambley bushes that line the fence-line and they are not coming out. In a moment of frustration I put my hands on my hips and look up. And that’s when I see it. The wind is blowing the clouds so fiercely it looks like they are tumbling over one another. They move so fast that it’s striking and supernatural and other-worldly. And I cry a little, because my tears are always near the surface these days. I cry because I’m reminded that He is still BIG and He is still HERE and I had forgotten that for a minute or a day or more. But there’s no denying it. Chance doesn’t make clouds like that with a flawless blue backdrop, and order doesn’t magically appear out of chaos. And Phoebe wasn’t just some happenstance of cells coming together. His fingerprints are suddenly on everything and for a moment I’m drawn out of the abyss with the stark raving beauty of it all.